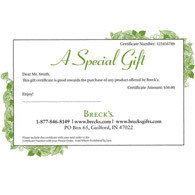 Give a gift any gardener will love—a Breck's e-Certificate. Available in $25 increments, your gift will arrive promptly with no fee for delivery. Then the lucky recipient can take their time browsing our huge selection of Dutch bulbs, perennials, garden accents and tools at Brecks.com. Great for last-minute gifts, e-Certificates will arrive promptly, but during our busiest times, they could take up to 1 hour. 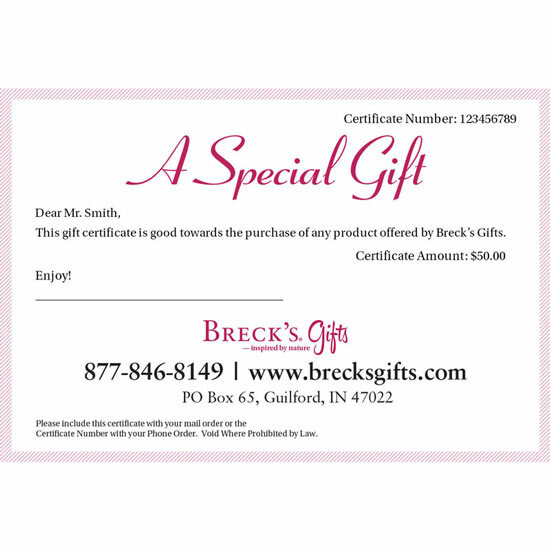 To place your order, simply choose a gift amount and provide your recipient's email address. Additional Discounts and coupons do not apply.